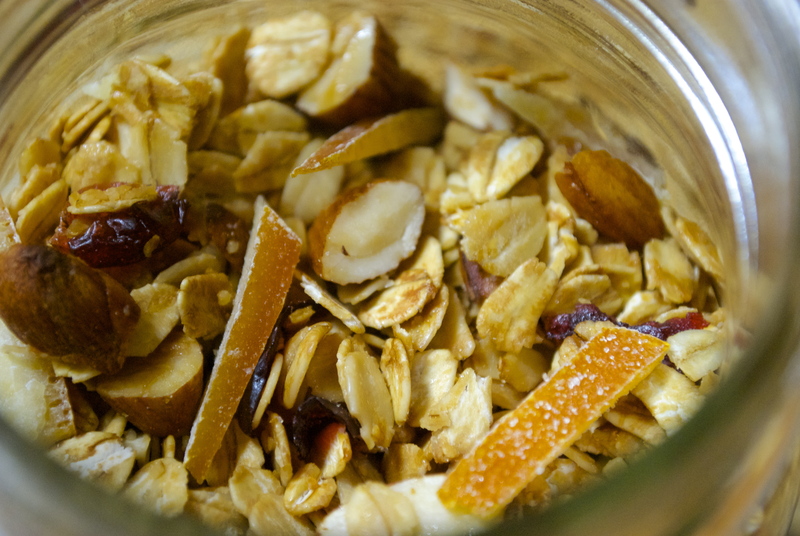 Was it Worth it: Can candied orange peel brighten up granola? 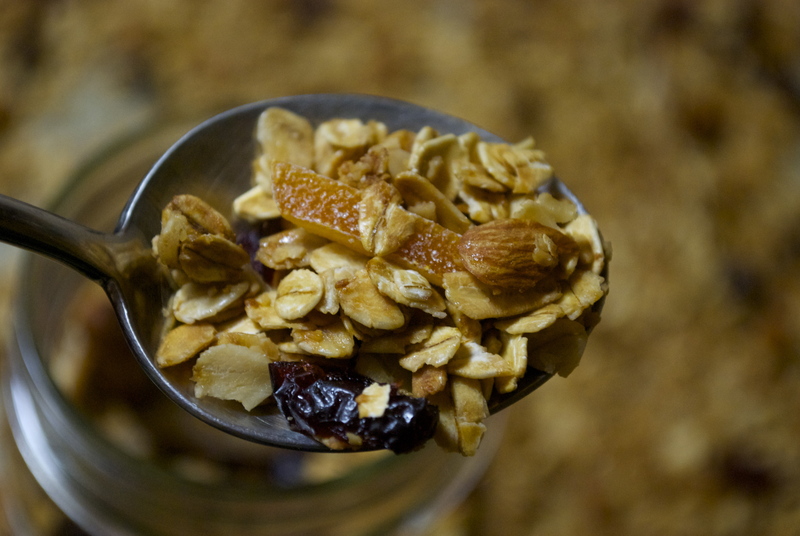 The Background: It seems silly to do a long post about granola — lots of people make it and it’s so versatile that any recipe you have can be tweaked one way or another depending on your personal taste. And yet, this recipe in particular called out for me to do a post about it. Why? Because of this ingredient: candied orange peel. I not only love homemade candied citrus peels, but I happen to have some leftover from Christmas and had never thought to use them in granola. It seemed like such a stroke of genius, though I was worried the candied part might make the granola too sweet. Thus, the recipe needed testing! The Substitutions: Like most granola recipes, this was pretty easy and straight forward so I didn’t feel bad with making minor changes. I used whole almonds coarsely chopped instead of sliced and I cut back on the golden raisins because I’m not a huge fan. The Unexpected: Besides the candied orange peel, there were a few other things that made this recipe a little unique. One is that the oats are first toasted totally in the buff — no oil, no butter. This gives them serious crunch, which I love in a granola. They are then mixed with nuts and a combination of butter, hazelnut oil and maple syrup before going back into the oven. And even though the maple syrup is plentiful, the oil and butter quantities are quite small (1 tsp and 1 TB respectively) so this is a granola you don’t have to feel bad about loving. The Result: This granola was fabulous. The crunch was perfect — I often brought it to work and would sometimes be halfway through a bowl when I would have to take a phone call. When I wrapped up the call, sometimes 15 minutes later, the granola was still crunchy! The candied orange peel was also awesome in this and despite my fears, it didn’t add sweetness to the final product. 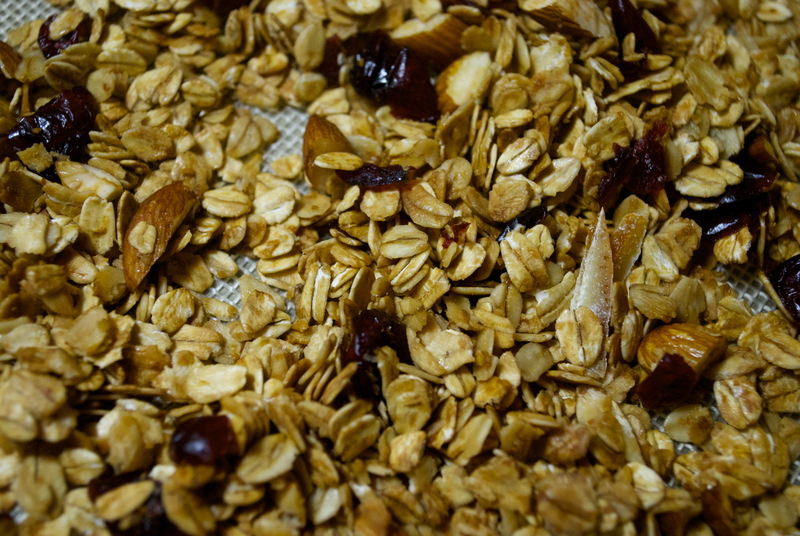 Instead it gave the granola a nice chewy texture and a bright citrus flavor. Every strip of peel was like a pop of sunshine! 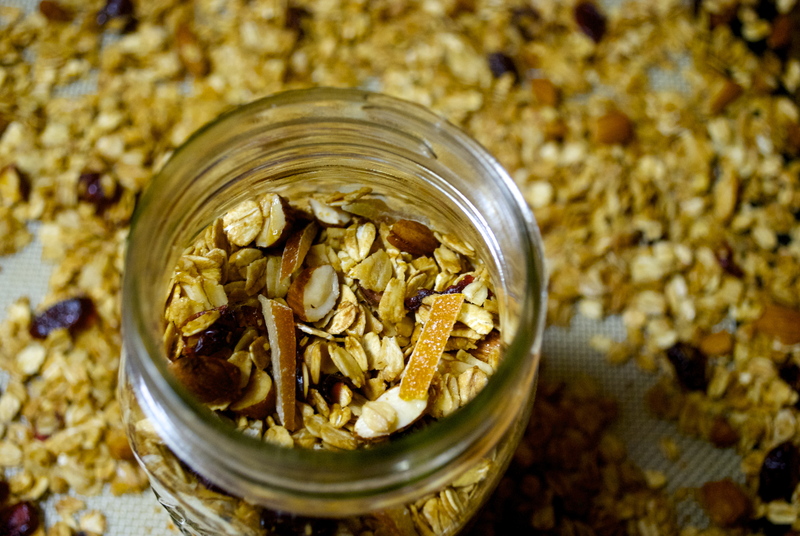 Sometimes I use orange zest when I make granola but those days are over. This is clearly the granola of the my future. The Verdict: Make it, you’ll love it! A spoonful of this is better than a spoonful of sugar! This entry was posted in Brunch, Edibles, Grain, Sweets and tagged bonappetit, citrus, food, granola, health, oats, orange, recipes, snacks, Wiwi? by Jessamine in PDX. Bookmark the permalink. You should put some bacon in there. yes, that would have been pretty perfect — salty sweet pork goodness!